The 'craft' beer world buzzes about hops. On the other hand, it often seems to relegate barley malt —just the essential principal source of beer's starch and thus its fermentation— to the level of inconvenience. In 2013, I attended a short presentation at the Craft Brewers Conference at which the lecturers almost begged 'craft' brewers to tell them what characteristics they wanted in their barley malt. In their choice of barley, craft brewers share, with the macro-brewers, a need for lower free amino nitrogen, lower total protein levels, and a lower Kolbach Index (ratio of soluble protein to total protein). The macros, however, use a high amount of adjuncts in their grists, usually corn and/or rice. A higher diastatic power is needed in their preferred barley to convert the starches of the adjuncts to fermentable sugar. 'Craft' brewers generally rely on all-malt grists; thus, diastatic power is not as important a parameter for them. Macro brewers want neutrally flavored barley. 'Craft' brewers prefer the opposite. They want the barley malt to contribute unique and discernible flavors. Up to this point, barley has been developed and grown almost exclusively for the macros; where it has been grown in North America, it has been geographically limited. To be clear, there are numerous malting companies and there are some specifically targeted at 'craft' breweries. But, as to the barley varieties themselves, except for some imports, 'craft' brewers have not had much of a say. According to the [U.S.] Brewers Association (BA) —the association for American 'craft' brewers, i.e., small American-owned breweries— when 'craft' beer reaches a twenty percent volume share in a few years (possibly as soon as 2020), 'craft' brewers will be snapping up fifty-one percent of all malt used by U.S. brewers. To satisfy that demand, malting capacity in North America will have to increase by twenty-eight percent —even as total barley acreage decreases. Things are beginning to change. A few years ago, the Craft Malsters Guild was created. Last year, the BA joined the Brewing and Malting Barley Research Institute (BMBRI) as a corporate associate member. The BMBRI works to identify and evaluate barley varieties that are suitable for the production of high-quality malt and beer. And yesterday, the BA announced that is granting nearly a half-million dollars —$440,000 to be precise— to nineteen unique research projects. Thirteen of those are devoted to research on growing barley specifically for 'craft' brewing. Craft brewers represent a 36% customer for U.S. malt consumption as of 2016. 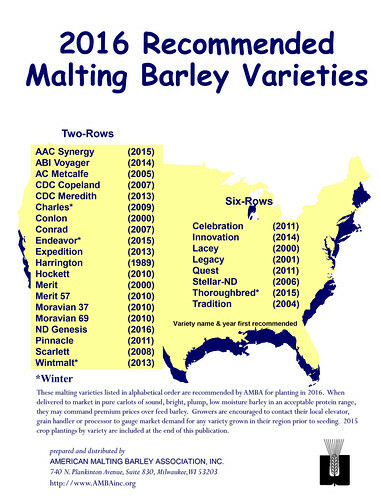 And yet, there are currently no malting barley varieties specifically bred for all-malt brewing in production in the U.S. Craft brewers currently use malt made from barley varieties bred for adjunct brewing, with negative stability outcomes in packaged beer. Mapping the genetic determinants of barley contributions to beer flavor using two very different types of germplasm and mapping strategies. This research will perform metabolite profiling of heirloom barley breeding lines developed at Montana State University (MSU) to facilitate breeding for flavor. Investigating the relationship between barley chemical composition and beer flavor is an important area of research. Some craft brewers have preference for malts from older, ‘heirloom’ varieties, although the chemical basis for this preference is unclear. Further, heirloom varieties are not adapted to many U.S. growing regions, and barley growers would be hesitant to adopt them for their poor agronomic performance, yield and malting quality. Barley is well adapted to dryland farming, however historic production of malting barley has been in higher moisture to ensure malt quality. In dryland conditions, current barley varieties have an increased risk of rejection due to poor malt quality, resulting in a significant economic loss to farmers. This research will facilitate regional production of malt for brewing in the Rocky Mountain region. Identification of two-row-barley cultivars with the best fit for all-malt brewing, and development of best practices for sustainable cultivation of those varieties. The 2017 ESBN [Eastern States Spring Barley Nursery organized by the Craft Maltsters Guild] includes 25 barley varieties from ten different breeding programs being grown in Indiana, Maine, Maryland, Massachusetts, Michigan, New Jersey, New York, Ohio, Pennsylvania, and Vermont. Trial data will be available for use by local university/extension personnel to educate growers and other stakeholders on varieties that perform best in their region. The University of Minnesota will organize a coordinated project with 14 breeders/researchers across 12 states/provinces to evaluate two-row spring malting barley lines in the upstream stages of breeding. Selecting low protein 2-row barley lines from all over the world will greatly enrich the genetic diversity of barley breeding and germplasm resources; and help ensure a supply of barley varieties suitable for all-malt brewing. To improve the genetic background of North American barley lines, genetic sources for stress tolerance, better malting and brewing quality traits, and disease resistance will be introduced to create genetic diversity and improve on current barley qualities for use in all-malt beer production. The overall goal of this research is the establishment of a sustainable Midwest winter barley industry for U.S. craft brewers. 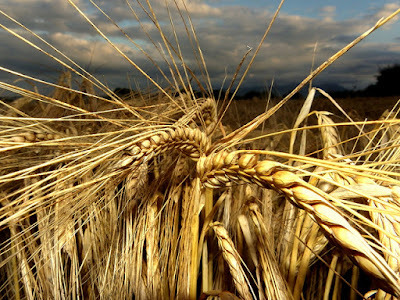 This requires the development of cultivars with acceptable malt quality profiles and adaptation to the climate. This project will exploit Russian barley accessions to develop winter two-rowed barley cultivars suitable for growing malt-quality barley in the Midwest; which will provide the Midwest craft brewing industry with more locally grown ingredients. [DNA] markers will be identified to facilitate and expedite the process of developing high quality, high yielding malt barley varieties for the Mid-Atlantic and eastern regions of the U.S. The ultimate outcome and impact will be new cultivars and an expanding barley market for malting barley (as well as feed and forage) in the Great Plains, a region with generally few diseases (very little Fusarium head blight), but known for abiotic stresses (harsh winters and heat/drought) and aphid pressure. Breeding for Winter 2-row Malting Barley Cultivars for the Eastern U.S.
Our goal is to develop superior malting quality barleys having high grain yield, desirable agronomic qualities, and the disease and insect resistance needed for production in the high-humidity environments of the eastern U.S.[...] from Georgia to New York. The Craft Maltsters Guild would like to develop a guide for barley producers outlining storage and handling [specifically for the craft brewing industry]. The Craft Malsters Guild will be meeting and exhibiting at April's Craft Brewers Conference in Washington, D.C. But the conference itself —the annual, premier conference of/for American 'craft' brewers— has scheduled only one seminar on the subject of barley. More, please. More 'craft' barley, please. The Brewers Association's press release on funding for projects in 2017: here. Journalist Adrienne So's piece on the paucity of 'craft' beer malt: BeerWest Magazine. Being from the East Coast, the three projects in which I am particularly interested are those of North Dakota State University, Virginia Tech, and the USDA Agricultural Research Service (Raleigh, North Carolina). All three will examine the success of growing different barley varieties along the eastern seaboard.